Today the team raced the Swiss National Relay champs, held just north of Zurich on a map called Hasenberg. The terrain was part typical continental Europe forest, with a plethora of tracks in a grid like pattern, with dark green areas accompanied by flat, featureless contours. The other part of the map was steep, detailed contoured areas with a complex network of winding tracks. The main challenges were from route choice and micro route choice, choosing whether to stick to the tracks and run fast, or to bash through the green, wet, slow forest. This was on top of the added challenge of the relay, with people around all the time and not knowing who was on your course, and which trains to join. I ran first leg for my team, followed by Lara and finished off by Kayla. 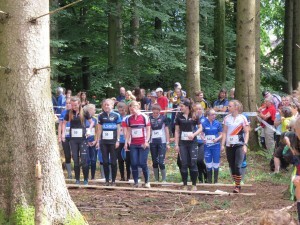 Standing in the start area, surrounded by Switzerland’s elite female orienteers, and being on the front line, was both exhilarating and nerve wracking. The countdown, in Swiss-German, was hard to keep track of, and before I knew it the word “Go” was shouted and we were off, plunging into the deep dark forest. After st ruggling to find the start triangle for a little while, I finally got on top of it and joined the large trains heading towards the first control. The first few controls were in the typical continental forest, but control 5 was a long leg across a complex networking of tracks, over to the slumped area. This made it a bit more interesting, trying to pick whether it was best to go straight through the steep, green, small hills, or around the winding tracks. The brutal finale was up a huge hill to the finish run through, out in the open in front of the cheering masses. It was a tough day out for all, and by the time we got to this stage of the course we were all absolutely spent, as shown by the amazing facials each team member displayed in the finish chute. Tomorrow we will have a chill day sleeping in, and recovering. Tuesday will be the last full on day before the competition starts, with a sprint, and then a middle and relay on an amazing area called Füela Pass, a moon-like scape in the high mountains.